Forty-eight states have refused to fully comply with the commission’s request for voter data, but the order has already sown chaos at state election offices. On July 3, the Electronic Privacy Information Center (EPIC) filed suit against Kris Kobach and the Trump administration’s “election integrity” commission for not conducting a privacy-impact assessment before requesting sweeping voter data from all 50 states. In remarkably short order, the commission’s request for voter data has led to an unprecedented political and legal backlash. 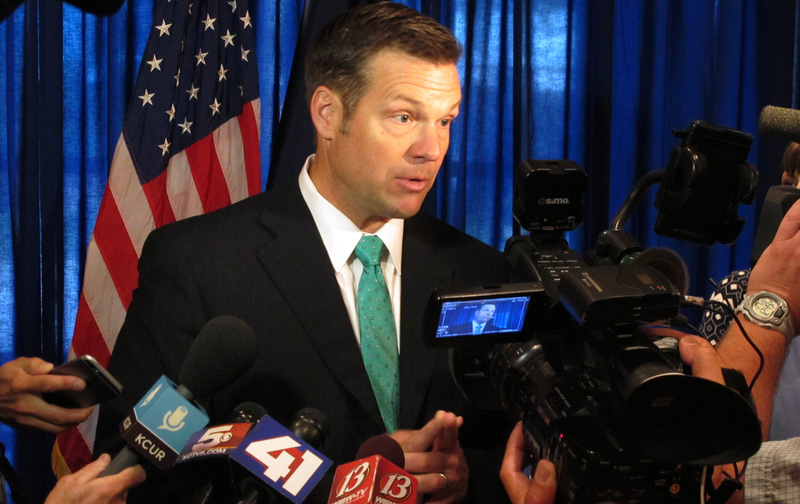 Forty-eight states have refused to provide all of the data Kobach asked for. And EPIC’s lawsuit was followed by similar suits by the ACLU, Lawyers Committee for Civil Rights (two lawsuits), Public Citizen, and voters in Florida, who allege that Kobach and the Trump commission have violated at least six different federal privacy and ethics laws. In the span of a week, six major lawsuits have been filed against the commission. The Trump administration told states yesterday not to send any voter data until a federal court ruled on EPIC’s motion. Before the commission has even held a single in-person meeting, its work has been an unmitigated disaster. Yet it’s already having a devastating impact on voting rights—which may have been exactly what Kobach and company wanted. In the days following Kobach’s request for voter data, election offices in states like Arizona, Colorado, Florida, and North Carolina have been deluged by angry voters seeking to un-register to vote. Denver saw a 2,150 percent increase in voters canceling their registrations, according to Director of Elections Amber McReynolds. “In over 12 years of administering elections I never expected to see a day in the office where we would have more withdrawals than new registrations,” she told The Colorado Independent. Hundreds of people have called the Raleigh office of the Bipartisan State Board of Elections and Ethics Enforcement, and at least 380 people sent email, said board spokesman Patrick Gannon. Some of those voters—the office doesn’t have a count—are asking to cancel their registration or for instructions how to do so. “Kindly remove my name from NC voter rolls immediately. Thank you,” one voter wrote Wednesday, adding that the commission “smells funny” and the people in charge could not be trusted. The latest addition to the commission is J. Christian Adams, who served alongside von Spakovsky in the Bush Justice Department. Their boss, Bradley Schlozman, said he wanted to “ “gerrymander all of those crazy libs right out of the [voting] section.” Adams was “exhibit A” for the improper hiring and rampant politicization that occurred during the Bush years, according to former voting-section chief Joe Rich. Today Adams is best known as the leading figure behind the New Black Panther Party conspiracy theory. He accused the Obama administration of “a hostility in the voting section and in the Civil Rights Division to bringing cases on behalf of white victims for the benefit of national racial minorities.” Since he left DOJ, Adams has been suing states and counties to force them to purge their voting rolls, as Mother Jones reported—a preview of the types of suppressive tactics the Trump DOJ is prepping and the commission will no doubt recommend in its report. Return to race-neutral Voting Rights Act enforcement that seeks to block discriminatory policies and procedures based on demonstrable impacts rather than mere statistical analysis. Put an end to politically-driven pursuits against state photo voter identification requirements, citizenship verification in voter registration, and common-sense adjustments to early voting periods. Return to enforcing federal statutes barring against voter intimidation. Repeatedly, the Obama DOJ failed to act. Return to enforcing Section 8 of the National Voter Registration Act requiring that voter rolls meet federal maintenance standards. That’s a fancy way of saying DOJ should not enforce the Voting Rights Act and should support discriminatory voter-ID laws, documentary proof of citizenship for voter registration, cutbacks to early voting, and voter purges. This would have a catastrophic impact on voting rights. The likes of Kobach, Blackwell, von Spakovsky, and Adams have for years spread debunked lies about voter fraud and have championed efforts to make it harder to vote, often in violation of federal law. Putting them on an “election integrity” commission is as bad an idea as Trump’s forming a “cybersecurity unit” with Vladimir Putin. Listen to Ari Berman on the Start Making Sense podcast.